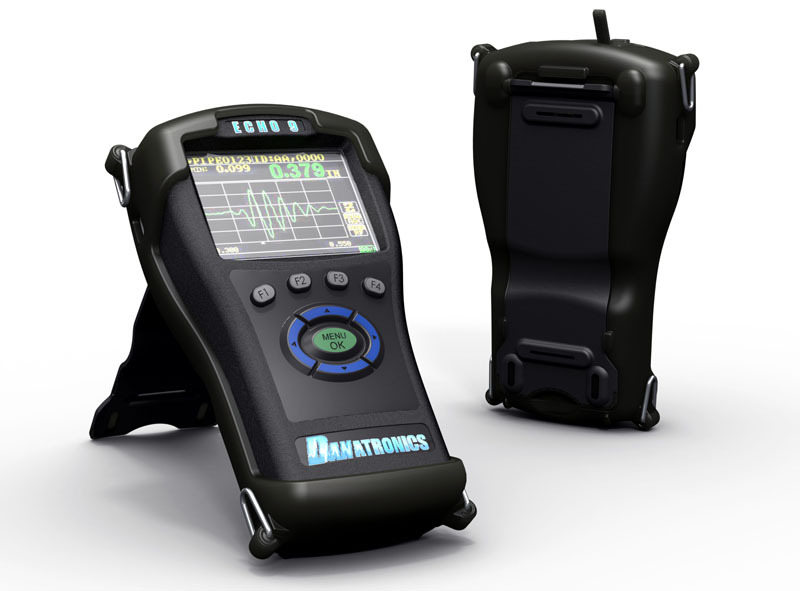 Danatronics listened to their customers and asked Stream to re-imagine their brand to create a new ultrasonic thickness gage that incorporates features their users requested. Using ultrasound technology, Echo 9 measures thickness of materials such as a pipe's wall thickness or internal corrosion. It is comfortable to hold in your bare or gloved hand, with or without the rubber boot accessory. Controls are easy and intuitive to operate. Danatronics' customers said they need one handed operation, so we provided a stand that pivots out the back when needed, and D rings are provided to attach a shoulder strap. Echo 9 is used by technicians in hazardous environments such as outside on a ladder in a thunderstorm. It's IP67 rating ensures it is water tight to 1 meter depth. Because the innovations are answers to market needs, Echo 9 is performing well in the industrial ultrasound market, and maintaining Danatronic's leadership position. Learn more about this product from Danatronics here.